Kopke was established in 1638 by Christiano Kopke and his son, Nicolau Kopke. The company was sold to the Bohane family, by the end of the 19th century, who tried to run it from London. The distance and the two World Wars disabled the control of the Company and they decided to sell it. In 1953 the Barros family bought the House of Kopke. In June 2006 it was sold and became a part of the SOGEVINUS Group. I bought this 750ml bottle at 20% in Rema 1000 supermarket in Odense, Denmark at the price of 25 Euro. 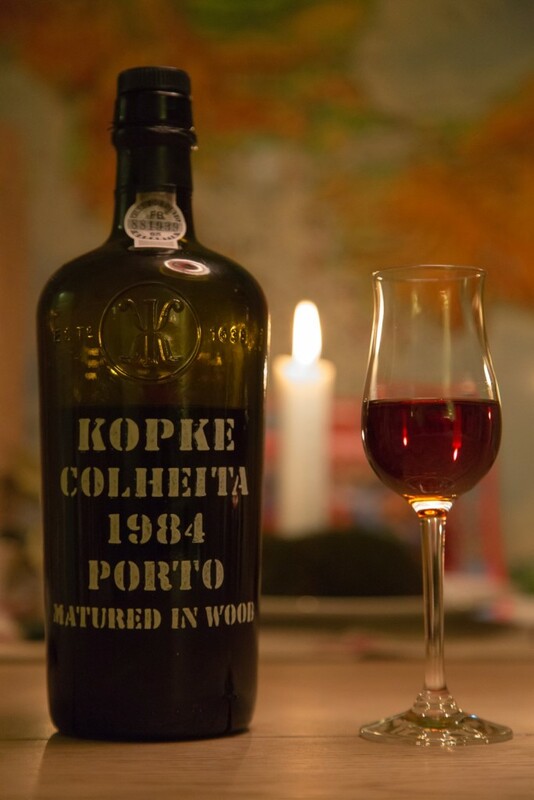 This Kopke Colheita 1984 was bottled in 2014. Brown colour with glaring stars of red in the tincture when seen against the candle. Spices, dried fruits and a warm alcohol in the aroma. A little bite from the tannin, warm and with some oak in the taste. A good dried fruits taste, sweet with raisins in the after taste that lasts a good while. When first uncorked it is dominated by the alcohol and needs to breathe, no decanting, just needs to sit for half a day in bottle with level under the neck. That really works wonders on this cheap and to the price surprisingly good colheita, it mellows quickly over a few days, so enjoy it 1-2 days after opening. This entry was posted in Wine and tagged 1984, colheita, Kopko. Bookmark the permalink.